Editor’s Note: This is the first of five “things we learned” from our 4-year study. Check back each day this week as we reveal the entire list. AZGFD’s Zach Beard, Ryan Mann, and Andy Clark contributed to these posts. 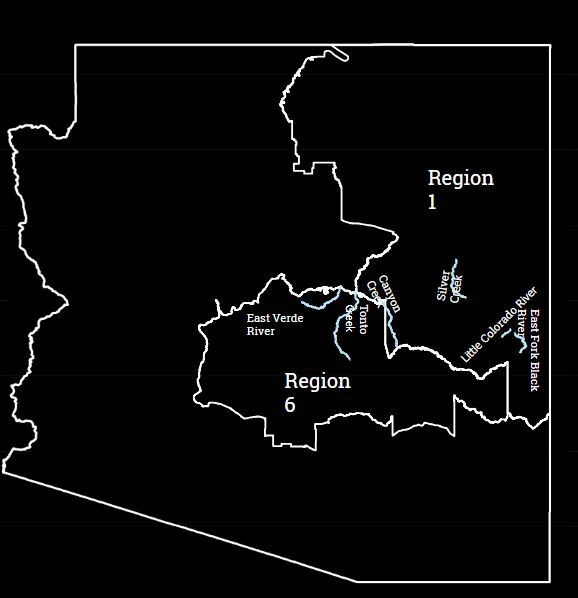 We just completed a 4-year study (beginning in 2013) to investigate the fate of rainbow trout and Apache trout stocked into several of Arizona’s popular stream trout fisheries. As part of this project, AZGFD biologists conducted nearly 5,000 angler interviews on six different streams (Canyon Creek, East Fork Black River, East Verde River, Silver Creek, Tonto Creek, and West Fork Little Colorado River) during the trout stocking seasons (April to September) of 2013–2016. From these interviews, biologists estimated total harvest (number of stocked trout kept by anglers), angler effort (total time spent fishing by anglers), and angler catch rates. 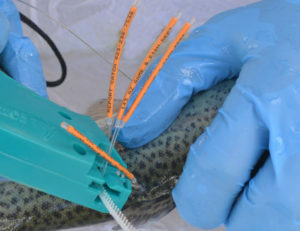 Our biologists also implanted trout with radio transmitters in order to track their movements and determine how long they survived in the streams. Study area of AZGFD’s “Fate of Stocked Trout” 4-year study. Check back tomorrow for No. 2: Trout don’t move far from release locations.